Magaosi is a brand of HiLisening Co. that is located in Guangdong – China. The Magaosi product line is covering products series marked with M, BK, K, DT and B. The M series have mainly a metallic housing with Balance Armature and /or Hybrid Drivers. The BK series have wood housing with Balance Armature and/or Dynamic Hybrid drivers. The K3 HD belongs to the K series, which is the top of the line for Magaosi products with multi driver configuration like Balance Armature and Hybrid technology. Magaosi K3 HD was provided to me by Magaosi via Penon Audio for free of charge as a review sample. I am not affiliated with Magaosi or Penon Audio beyond this review and these words reflect my true, unaltered, opinions about the product. The Magaosi K3 HD is available on Penon Audio for 110,00 USD. The Magaosi K3 HD comes in a black box that is wrapped with a glossy white card box sleeve that shows the product, brand and informations about the produt itself. The carry bag that comes with the Magaosi K3 HD is made of a faux leather coating. It is quite useful with its size and is also well made. The foam and silicone ear tips are very comfy, especially the silicone ones that have a nice soft coating that has an olive tips like appearance. There are also 2 sound filters which one of them comes preinstalled. The silver filter gives a balanced tuning, while the black filter boasts the treble range. I would be advice you to be carefully while replacing the filter, because they are very small and there is no backup/second pair. They are also 2 cables in the box. The braided one is made of OFC (Oxygen Free Cooper) and has a MMCX interface with L – angled 3.5mm Single Ended headphone jack. This cable has a black plastic coating and has only some low microphonic effects. The second cable is a non braided SPC (Silver Plated Cooper) cable that was advertised as upgrade cable. This cable has also MMCX connectors that sit good to the female connectors on the K3 HD monitor. This cable is a bit stiff and has a straight 3.5mm gold plated headphone jack. The microphonic effect of this cable is a bit higher than the first I mentioned above. The Magaosi K3 HD has a relative small and ergonomic design. The housing is made of metal that looks like an aluminum alloy and has a good build quality. The K3 HD is available in 3 different color options; those are Gray, Blue and Orange. My unit has the orange color that looks fashion look. The MMCX connector is solid and doesn’t look like to get damage easy with time. On the front of the monitor is the Magasoi Logo, the left / right markings and two bass vents. The inner side of the monitor sports the K3 HD model name that is printed in white a color. The nozzle is 45 degrees angled and has a detachable sound filter on the top. If you remove this filter you can easily see the balanced armature driver that is placed inside the nozzle. The Magaosi K3 HD has an ergonomic design and is comfortable to wear. The fit of the K3 HD is good with average noise isolation. The Magaosi K3 HD has an impedance of 32 ohm and is a quite sensitive and easy to drive IEM with almost any portable source. My Samsung Galaxy S8 was able to push the Magaosi K3 HD to very uncomfortable and loud volume levels. This review was written after a burn-in process of approx 100 hours. 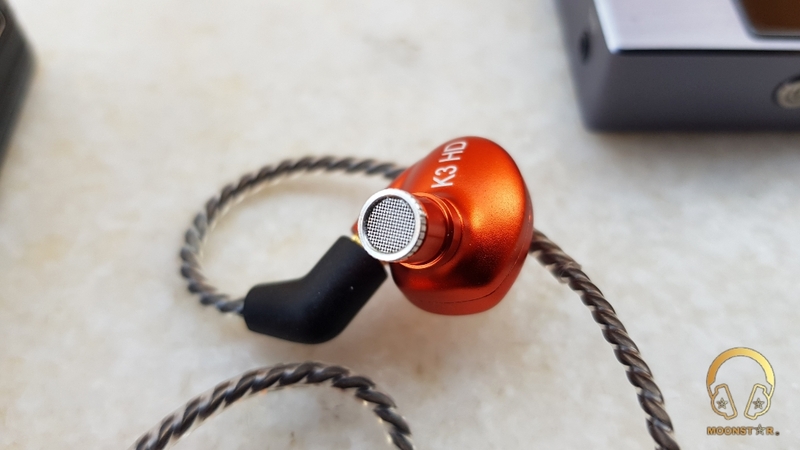 I have used the black olive silicone ear tips and silver sound filters with the silver upgrade cable for this review, which all came inside the box. Magaosi K3 HD has a V-shaped sound signature with a tonality that is on the warmer side of natural due the bass presence. The Magaosi K3 HD comes with two different tuning filters. The one is in silver which sounds cleaner and more transparent compared to the black filter that is adding additional brightness and sparkle to the sound. Magaosi K3 HD has a V shaped sound signature with emphasis to the lower and upper register. The Midrange sound a bit thin and recessed and reminds me to the tuning of the Dunu Falcon-C that has similarities in this area. The K3 HD has some good bass response, with nice extensions and definition. There is missing some weight in the sub-bass area between 20 – 50 Hz, which is otherwise pretty controlled. The bass of the Magaosi K3 HD is mainly focuses between 200 – 400 Hz, which has good texture and attack, but with an above-average resolution. The Magaosi K3 HD has enough bass for instruments like bass guitars or drums, but it lacks a bit of fullness. The best thing about the bass of the K3 HD is its clearness, which avoid any muffled presentation, especially in the midrange. As I mentioned before; the Magaosi K3 HD has a recessed midrange that sounds otherwise very transparent and clean. The detail retrieval is in a very good level for this price range, but is missing a bit of fullness. The midrange has enough space for instruments and vocals and there is no stress while presenting some complex passages like in Alboran Trios – Fanfares. The midrange warmth for female vocals is ok, but is missing a touch more for male voices. The clarity and definition of instruments is pretty darn good and wouldn’t expect more at this price point. Bu I must say that the Magaosi K3 HD is not for people who want a warm and intimate presentation, but is quite suitable for those who prefer transparency and clearness. The upper midrange is dynamic and well presented. There is no upper midrange harshness and the stress level in some tracks of my test tracks like Metallica’s – Sad but True or Megadeth’s – Sweating Bullets are in a tolerable level. There is a nice transition between upper midrange and treble range with a bright but relative controlled presentation. The treble range gives the overall presentation an airy feel, has an above average extension and is adding a nice touch of clarity. I wouldn’t prefer to use the black filter, because it sounds a bit unnatural at the higher frequencies and is causing to sibilance in some bad recorded tracks like Metallica’s – Sad But True, which sounded much better with the silver ones. When it comes to soundstage, the Magaosi K3 HD has average depth, but with a relative wide stage, where instruments have a nice sense of space and quite realistic placement. Both IEM’s have a V-shaped sound signature, but the Pinnacle P2 has a warmer sound than those of the Magaosi K3 HD due the diffrent of bass tuning. One of the first noticeable differences of this two IEM’s is the bass tuning. The Pinnacle P2 has more sub-bass quantity and slightly better extension compared to those of the Magaosi K3 HD. The Magaosi K3 HD has the upper hand for the bass response between 200 – 400 Hz that sounds cleaner and tighter than those of the Pinnacle P2. Magaosi K3 HD has also some extra definition and better decay than Pinnacle P2. The midrange of the Pinnacle P2 sounds also a bit different then those of the Magaosi K3 HD. It sounds warmer and has a more forward vocal presentation. The midrange of the K3 HD sounds airier and also more clinical but a bit recessed compared to the Pinnacle P2. The Pinnacle P2 has better weight with some instrument like guitars and piano notes, but is missing of some definition and micro detail. The overall detail level and instrument separation is slightly better with the Magaosi K3 HD. Some female vocals like Aretha Franklin or Melody Gardot sounding more emotional, but a bit too veiled with the Pinnacle P2, while the Magaosi K3 HD sounds distant, but in a more transparent and clean way. The Pinnacle P2 has relative good control at the treble range and has good definition, but doesn’t sound as lifelike the Magasoi K3 HD which has a more vivid presentation. The Magasoi K3 HD sounds also more transparent and has some additional sparkle at the upper treble range. The TFZ Series 4 has more sub-bass quantity than Magaosi K3 HD, while the K3 HD has the better extension. The sub bass of the TFZ Series 4 goes lower and hits also harder. The bass of the Magaosi K3 HD sounds smoother compared to the bass that TFZ Series 4 has. Both the TFZ Series 4 and Magaosi K3 HD have a v- shaped sound signature; the main difference is the presentation. The TFZ Series 4 has a more forward vocal presentation than those the Magaosi has. The K3 HD has more midrange clarity then the Series 4 and sound in a more transparent way. This ability gives the K3 HD the upper hand for micro detail retrieval. The upper midrange of the TFZ series 4 sounds softer and has some roll off between the 3 – 4 kHz ranges. This tuning gives the TFZ Series 4 a more engaging sound presentation, but is missing some detail that the K3 HD has. The overall vocal performance of the K3 HD is slightly better due the more realistic presentation. The TFZ series sound emotional due the warmer tuning and upfront vocal reproduction, but sound a bit veiled compared to the Magasoi K3 HD, which has additional clarity. The TFZ Series 4 sounds quite good with male vocals, while the K3 HD has the more realistic presentation with female voices. The detail retrieval for instruments and the precision is slightly better with the K3 HD, which has more space and air between instruments. The Magaosi K3 HD has more treble presence and upper treble sparkle. This tuning makes the sound of the K3 HD extra definition. The TFZ Series 4 is missing some treble extension, which makes Magasoi K3 HD more detailed sounding. The Good thing about the treble tuning of the TFZ Series 4 is that it has a relaxing presentation. The Magaosi K3 HD has the wider soundstage presentation, while the depth difference is not that great, but again has a better performance on the Magaosi K3 HD. The K3 HD also offers better imaging and instrument placement. The Magaosi K3 HD is pretty nice sounding product with good build quality, which is suitable with almost any music with the exception of genres like metal or hard rock. The price to performance ratio is quite good and I can only recommend it at this price point.